Even before I started this blog, friends would come to me with their random queries, seeking whatever wisdom I had to impart. I think it's because I have a real know-it-all quality about me (in case you haven't noticed), and, since I don't like to be wrong (or potentially miss a question on Jeopardy! ), they know that if I don't know the answer myself, I'll usually do the legwork to find it out. To that end, I am starting a new Q&A feature on A Charmed Wife, called "Ask Me Anything". Email your burning questions to acharmedwife@gmail.com, or leave a comment on the site, and I will do my best to relieve the burning. For today's installment, we hear from my friend, Kim and her sister/roommate, Amy. My heart aches to think of two sisters in a caffeine-fueled rage, a rift driven between them over proper grounds storage. The good news is that you can stop fighting, because you are both wrong. Your first mistake is buying pre-ground coffee, but I know you know that already. Coffee starts deteriorating (losing flavor and getting stale) as soon as it's roasted, and ground coffee deteriorates much faster than beans (simply because they have more surface area). Your mission (should you choose to accept it) is to slow this deterioration as much as possible by reducing the beans'/grounds' exposure to their natural enemies: moisture, light, air, and other flavors. For that reason, it is always best to grind your beans just before you brew your joe. But I admit that sometimes, when laziness overcomes, I too have purchased the pre-ground beans, so ye without sin cast the first stone. You are correct that a glass container will allow too much light to hit the grounds and decrease their flavor shelf-life. Amy is correct that, once opened, the plastic bag the grounds came in allow too much exposure to air, and the plastic itself might taint the flavor of the coffee. You both are best off compromising and buying an airtight, light-proof, ceramic or stainless steel coffee canister. 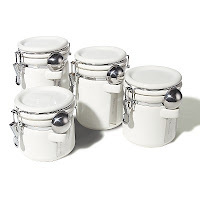 I like these White Hinged Canisters ($23 for 4), available from Amazon, because they're cute and come with a measuring spoon. You can use the other ones for tea and sugar. Just don't store more than two weeks' worth of coffee at a time. Your next best option is to leave the coffee grounds in the bag they came in and place that bag in a Ziplock bag and force all the air out of it, and put that in a cool, dark cabinet. But if your grounds taste plastic-y, don't blame me. Lastly, I want to address the issue of storing coffee in the fridge or freezer. 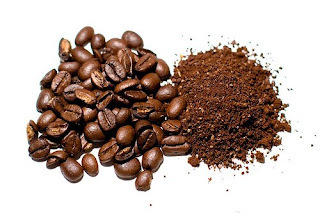 1) Don't ever put your coffee beans in the fridge- it's moisture and other food flavor heaven in there, and your beans are powerless against them. 2) It's only worth putting coffee in the freezer that you aren't going to use in the next two weeks. Like, if you went to Costco and just couldn't resist the 20 lb. sack of Starbucks, you should take out a couple week's worth of beans and store them at room temp, and wrap the rest in a plastic bag or saran wrap, and stick that puppy in the back of the freezer til you need it. Ladies, I hope you can now set aside your differences and find peace with each other. Preferably over a nice, steamy flavor-rich cup of coffee.